So how does BI work and what makes it so effective and powerful? Gartner say that a key task of Business Intelligence software is “the task of making ‘hard types of analysis easy’ for an expanded set of users”. Before “self-service” BI, data reports were exclusively created by specialised analysts trained in data visualisations. Business professionals tried to make the analysts understand the business need for the data so that the reports could be useful to end users. These were typically non-IT managers who needed the information to understand current metrics and trends and to guide decision-making. It could take days to weeks to create a sophisticated visualisation that showed the key features that managers wanted to present. Now these reports are generated by software such as Microsoft Power BI, so you can query the data in a few seconds and with a few clicks to make it show everything you need to know. The interface is professional, intuitive, and interactive, and it addresses questions you can ask in natural language. It’s not necessary to create a complex plan like, “OK, what parameters do I have to use to make this command show a value over a date range with respect to a subgroup”. You could just think, and click on parts of the report itself to show, “January sales in the Accessories department”. You could do so in real time, in a meeting, or even on your mobile phone. Power BI even allows you to ask Cortana to perform the query for you. Much of this functionality works using presentation graphics called dashboards. 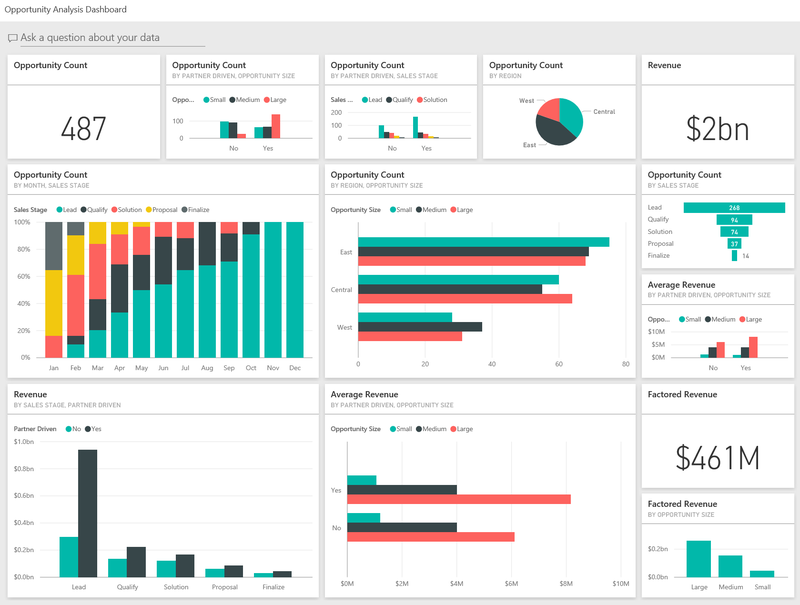 Below is a sample Opportunity dashboard from Power BI. Each space in the dashboard, known as a tile, is a report on a given metric in terms of other data and metrics. Dashboards work best when they use data from multiple data sources. 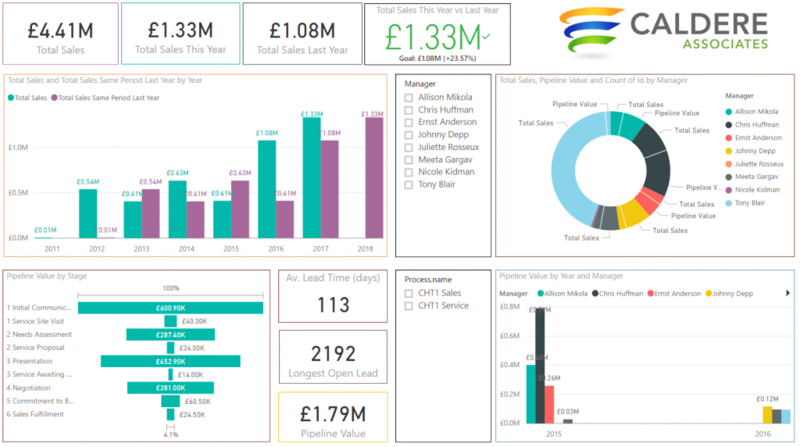 Power BI can gather data from your existing databases, your CRM solution, your own Excel and other files, or even data from outside your organisation (such as a reference table on a website). Note that many of the tiles draw from different fields within the data. Look at the Opportunity Count tile that shows the count in terms of time (months) and sales stage (Lead, Qualify, Solution, Proposal, and Finalize). With a few clicks, you can choose to sort and refine your visualisation in different ways. You can drill down on the data to answer a more specific question, such as what the count is for just the first quarter of the year. Tiles can also interact with each other if their data overlaps. Note that two tiles, Opportunity Count by Region and Opportunity Size and Revenue by Sales Stage and Partner Driven status, have data in common with a third tile, Average Revenue by Partner Driven status and Opportunity Size. You could perform a quick query with just a few clicks to see what might happen to your revenue if, for example, the West region had as many Medium opportunities as the Central region. Advanced dashboard users can change the visualisation formats for each tile if they like. They can create their own tiles and even whole dashboards that draw on data they specify. Dashboards are powerful! But what else is in a BI package that can put my data to work so we can concentrate on profitability and productivity? 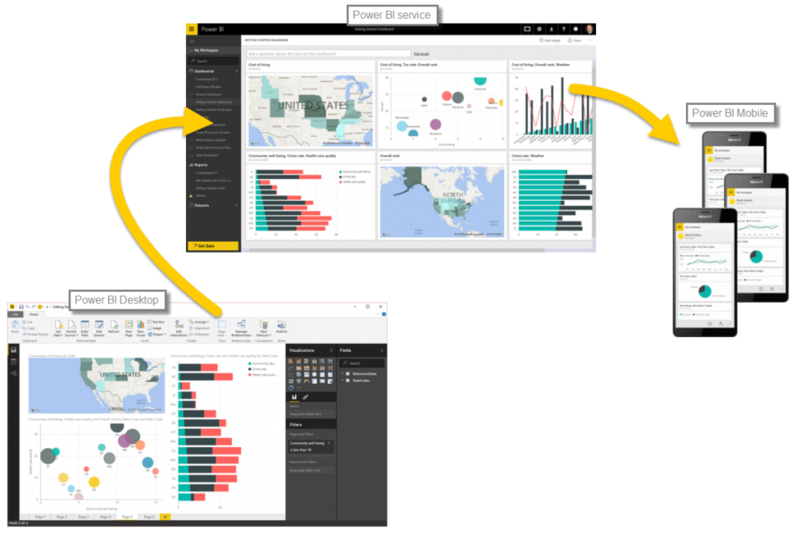 Bring data into Power BI Desktop, and create reports. Publish to the Power BI service, where new visualisations are created and dashboards built. Share their dashboards with others, especially people who are on the go. View and interact with shared dashboards and reports in Power BI Mobile apps. Cloud BI hosts the software on the Internet, reducing storage and other costs and making access to organisational data and insights faster and more convenient. Mobile-empowered platforms allow users to work with BI on-the-go on smartphones, tablets, and other devices. That looks great, but is it right for my company?